At lunch the first day, my coworkers asked if I'm a Monday vegetarian or a Lunch vegetarian. Apparently some people in China eat vegetarian only on Mondays or during lunches. It's a health/lifestyle thing. 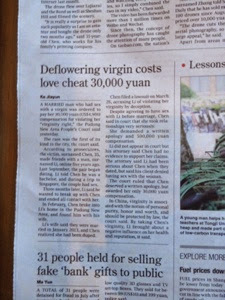 "Deflowering Virgin Costs Love Cheat 30,000 Yuan" (about $5000 USD). 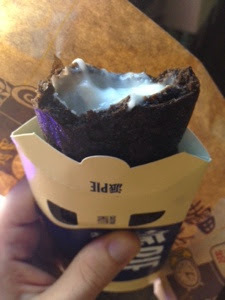 McDonald's in China has their version of the handheld pie - coconut cream filling and chocolatey outside! Super flamboyant waiters singing and dancing and flirting with me (just the male waiters). 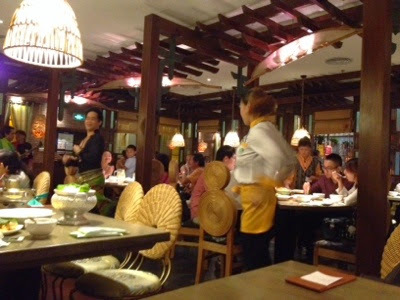 I don't know if homosexuality is accepted in China but the Banana Leaf Thai restaurant is pretty cool :) This is just before they started a Conga Line of customers around the restaurant. At checkout, the cashier asked if we used the wetnaps they gave us at the beginning. My coworker said he didn't, they made him go back to the table to return the unopened wetnap to avoid a napkin fee!! The phones in our office are very complicated. We have one that's on a Chinese phone line and one on a US line. Today I tried for 10 minutes to place a conference call to both the US and China. I tried every combination of numbers, including adding 1's and 0's in front of the country or city code trying to get it to connect. Just as I was about to give up, I heard a loud commotion in the lobby and was asked to come out. Three completely serious police officers were there and it looked like we were getting raided. All the worst thoughts went through my head. The crowd was growing bigger, I saw faces I'd never seen before, there seemed to be more people in our lobby than employees in the company. The officers asked a question and somebody translated it as "Did you call 110?" "Yes." Then everyone (except the police and me) broke out into hysterical laughter. I'm not sure if it was just funny that I dialed the Chinese equivalent of 911 - or that I freely and immediately admitted it. They took a copy of my passport and now, dear readers, somewhere in Shanghai there's a file with my name on it! 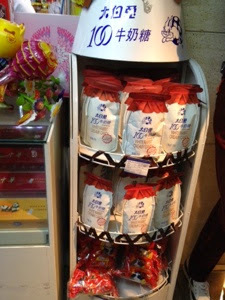 100% White Rabbit Creamy Candy... There must be something lost in translation! Geez Grenetz, you find new and interesting ways to get in trouble ;) Hope you don't end up in a Chinese prison... Looking forward to your next post! Did you ever get the conference to work?? Thanks everybody for your concern over my conference call while I was facing uncertain peril in the stockade! I told everyone to dial into a regular conference calling service, which is what a same person would've done from the start. They only had to wait a few minutes while I was detained -- literally!